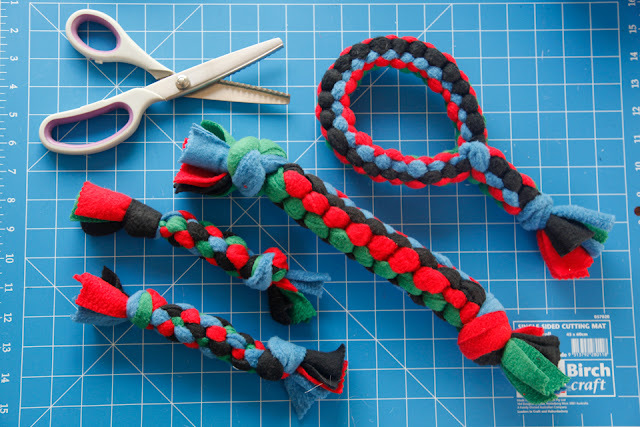 For those of you who loved our square knot fleece dog tug toy (thanks! ), you'll be happy to hear that we find ourselves needing to make a new tug toy every month or two, thanks to the destructive dog teamwork of "Sharky McFang" (one of Humphrey's many nicknames) and "Oli the Ripper"! Oli prefers a nice loop to get his mouth through, so here is a simple little variation for turning a basic square knot fleece dog tug toy into a loop and tail tug toy. Cut 4 long narrow strips of fleece. Note: You can scale this toy to suit your dog by altering the width and/or length of the fleece strips. I worked with approximately 4cm x 2m heavyweight strips for the toy shown in this post. There is no need to be too fussy about straight lines when cutting if you are using scissors. Align your strips into a single long bundle. Knot your bundle at the point where you plan to eventually close the circle, leaving enough length on the other side to make your tug handle later. Keep this knot loose - it is temporary just to secure the strands while you get started on your weaving. Where to start depends on how big a loop vs. tail you'd like to make but a starting point approximately 1/4 from the end was used in the tug shown. The loop portion of the tug was woven from the temporary knot until the loose strips of my working end were a similar length to loose strips at the starting knot. Starting on the working (long) side of your temporary knot, position the strips into a starting cross (+) and weave the fleece strips together using a simple square knot technique (detailed how-to diagram and images available here). Once you have woven a long enough section of tug that you would like to join the ends to make your loop, untie your temporary knot. Pull the ends of your tug together to form a loop. Try to align like colours. Tie your side colours to close out the appearance of a ring when joining the loop. This looks neat and tidy, but also secures the loop to make it easier for you to pair strands and start to weave the handle (further instructions below). In the toy shown, the side colours when I pulled the loop closed were black (shown tied in the image below) and blue (tied on the opposite side). The red and green strips were not tied together at this stage. Now that the loop is closed, you're ready to weave the tail. It is created by continuing the square weave, but there are now eight strands of fleece (four from each end) so a little prep work is required to get things into position before you continue weaving. Pair your fleece strips so that the eight ends become four pairs (match colours, if applicable). Position the strips back into a starting cross (+) for your square weave so that the colours (if applicable), line up with the closure point of your loop. Resume weaving until you are approaching the end of your strands of fleece. Not too close though! Leave enough room to tie off the end to finish the toy. Loop and knot securely, leaving a "tassle" at the end, and trim if/as needed. Since this is a adaptation from a basic straight tug, you might like to try making a basic straight toy first before you try joining and pairing if this is your first tug toy DIY attempt. Square weaving long strips can feel a little confusing at first. You may find it helpful to work with four different colours until you get the hang of things. As an added bonus, that also makes for a pretty result. You can secure the starting end to something, if you wish, but I prefer to be seated with it nipped between my knees. This allows me to freely flip the strands to the front, back over a shoulder, and from side to side as I weave. Don't leave yourself short on the tie-off - you'll need more fabric than you might think. I realize this is an older post, but I have a question. I love your tutorials! Thank you for them!!! If I want to make a thicker toy, I just have to adjust the thickness of the strips? Is there a way to make the center core...harder? I have made a few toys with your tutorials, but I would like to make some for bigger dogs...Labrador Retriever, Bull Terrier and Golden Retriever. To make a thicker tug using the same weaving style, you can use wider strips or heavier weight fleece. This works ok up to a point, but can start to get a little unwieldy for weaving and/or untidy in the patterns if you go too too wide with the strips as things twist and bunch. If this becomes a problem, my favourite "cheat" to make things extra thick is to double up on the strips and weave using narrower sets of pairs - essentially faking a super heavy/thick single strip of fleece. This cheat works particularly well in spiral tugs to create a fat tug but maintain a neat and tidy pattern. You can also weave more strands using a more complex pattern, like a twisted double spiral which is woven with six working strands instead of four like the basic squares or spirals. I find this weave to be a particularly good one for firm/stiff tugs. If you're feeling totally crazy, you can also weave or braid multiple tugs together, like our Tug of Tugs. This thing was a tank (still alive now and going strong after lots of play), but it isn't Humphrey's go-to choice of toy - he prefers his tugs a little more supple. Hehe. If you're weaving firmly with thick/multi strands, the tug should come up nice an sturdy/solid, with some stretch but not loose and loopy. I don't reinforced the core of my tugs, although you could in theory have a "solid" non-stretchy spine that you weave around and cover. Rope is an option, but even with a soft, strong, natural material rope I'm leery of it in my toys (bought or homemade) as loose strands or threads as it ages/wears create an added safety risk. Hope those ideas help, and give us a shout anytime. We do our best to reply to questions, whether the post is old or new. :) Good luck and have fun weaving/playing! Thank you so much for your reply!!! I did make a tug last nigbt with 5" strips of fleece and it worked out nicely. Also thanks to the link for the other types of tugs. I tried to figure out a 6 strand tug, but I couldn't get my mind around it. I will checking out. Thank you again! And our doggie friends thank you as well!! Very understandable about the double spiral - it's got a lot of strips going on when learning, but becomes much easier with practice. Have you tried weaving a single spiral using the circle twist weaving method (weaving on a diagonal to opposite corners instead of straight - see here for details)? Once you master the single, it's much easier to try and tackle the double as it's woven in the same diagonal method just with more moving pieces. The single also works well if doubling up the strips (eight strips, paired into four sets) for fat weaving. Hope that helps! One other question. Have you ever made these type if toys with pet tennis balls? We have a doggie friend that is ball obsessed!Thanks again! Thank you again for your replies. I have only done a couple toys. The spiral one and the box one. I will check out those other links. That makes sense about the tennis balls. Maybe I will try your version instead. Thank you again!!! P.S. As an extra thought for the ball-crazy dog friend, you can also weave around an intact ball - the ball won't be tied on/in through but it can be caged into the tug. He/she will likely pull it free in time, but might be worth a try and fleece is stretchy enough that you might be able to pop it back into place as well. Would you ever be able to do a video? I am a visual person 100% lol and tried doing this by written directions and I'm a little stuck. If you have any tips tricks thatd be great. Also the person who wants these toys said she wanted the toys to be 12 to 14 inches with the handle so how long do you think the strips I cut would need to be? Thank you so much! The tug is woven with a square knot and there are details instructions, photos, and a diagram in this post) for how to weave with that method. It's the easiest technique and is also simple for lining up the colours were you close the loop if you are making a multi coloured toy. 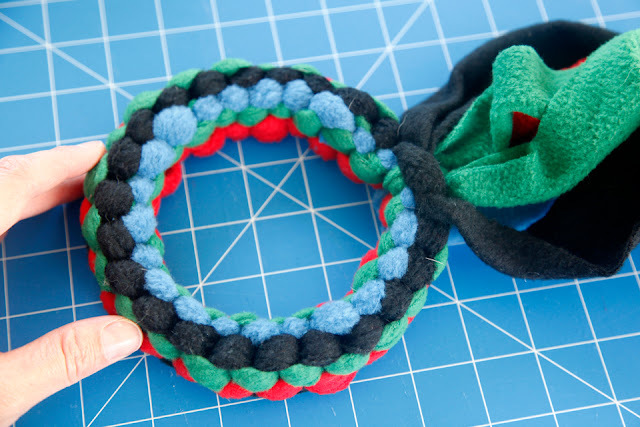 To make a loop with handle toy similar to the one shown in the post, you are weaving a section of tug, tying it's ends together to create a loop, and then weaving another section of tug. The loop is created first (four strands) and then the tail is created from the loose strands at the loop's joined ends (eight strands paired into four sets of two). I've added a few little adjustments in the text that I hope will help with clarity. The example toy shown in the post is a similar size, maybe a tad smaller (was woven using approximately 4-5 cm wide strips about 2m long). How long (and wide) your toy will be for a length/width of strips can vary quite a bit depending on both the weight of fleece you use and how tight you make each knot. In the case of a loop, the size of the loop vs tail matters too, since the tail is doubled strands it will be shorter and fatter. Thank you for your awesome tutorials! I have a question - how do you make your box weave tugs so thick? I'm using the same width polar fleece strips as you appear to be, but mine come out easily half the thickness of yours. I am pulling each layer as tight as it will go - should I be leaving the weave a little looser? But dont you get stretching and loss of shape if you dont weave it very tight? Hi Alla! It's most likely a combination of tightness as well as the weight (thickness/fluffiness) of your fleece. You're correct about shape. The looser your weave the more prone your tugs will be to stretching during play. The tighter you pull, the more compressed the knots will be and the tug will be firmer and skinnier. Tougher in some ways, but (with my dogs at lease) hard skinny tugs are also more vulnerable to biting through if they get a chance to pin and chew or to strand breakage. I like a middle ground for tightness where the knots are pulled securely into place, but not then cinched tighter. The tugs are securely knotted, but still slightly stretchy and not rock hard. Fleece comes in lots of different styles. Where possible, I prefer heavy weight fleece - it is extra thick and firmer than standard fleece, which gives both added bulk and toughness. I notice a significant difference between when using a good heavyweight compared to other qualities/weights that I sometimes buy due to availability of colour, price, etc. A little cheat to get a thicker and more solid/substantial tug with any fleece is to double up the strands instead of just going wider. I often do this, especially when weaving spirals or making fancy shapes. I find that if you go too wide with the individual strands, it becomes hard to weave a nice tidy pattern. I generally won;y go much later than the strands you can see in our basic box knot tug. Boo for big bulky bunchy strands. Much easier to work with pairs of narrower strands instead! The general weaving process is the same, just working with pairs instead of single strands. This trick is one of my favourite ways to weave a fatter toy.